Explore the Foodtown Weekly Ad Specials. 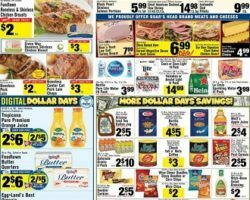 Get this week Foodtown Circular sale prices, grocery coupons, online specials, promotions and offers. Foodtown is a chain of grocery stores that operate in New Jersey, New York and Pennsylvania. The business was founded in 1955 and it grew progressively into a network of grocery stores that are today independently owned. Shopping departments at Foodtown vary from fresh produce, fresh meat & seafood, and dairy & cheese to deli, bakery and frozen foods. The produce department carries the usual fruits and vegetables, and in addition, it offers a selection of tropical fruits, dried fruits, cut fruits and jarred fruits. The vegetables selection includes anything from broccoli and cabbage to hard shell squash, mushrooms and peppers. The Foodtown most popular categories is the bakery, that serves and sells a number of bakery goods from staple items such as bagels, bread and donuts to pies, cupcakes, cookies, cakes and croissants. In addition, the department carries a number of specialty items, gluten-free items, sugar-free and fat-free items, as well as seasonal bakery goods. Offering amazing money saving opportunities through digital coupons, various deals and the Foodtown weekly circular, the company is known as one of the most convenient within the communities it serves. Save with Foodtown Weekly Ad Circular.